Anyone else go a little book crazy this week? What did you get in your mailbox? These are all books that I want to get soon also! I hope you enjoy! I'm on a book ban right now, so I'm buying very few! I've spent way too much on my last few IMMs haha. I'm really excited for Daughter of Smoke and Bone though, it looks AMAZING. Same with Sweet Venom. Nice haul! Enjoy! Daughter of Smoke and Bone and Mostly good girls looks good. I hope your enjoy them all! Happy Reading! i haven't seen much about isle of night yet. enjoy your books! Awesome books! 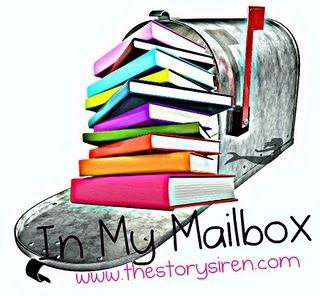 I just added Isle of Night to my tbr list this week. Sweet Venom has been on my list for a long time. Can't wait to hear what you think of them! I love your pile! All those pretty, pretty covers! I can't wait to get a copy of Daughter of Smoke and Bone, Sweet Venom and the Girl of Fire and Thorns. I got the chapter sampler of Daughter of Smoke & Bone earlier this week and definitely think I'm going to want the full thing.. I've heard nothing but great things about that book! Awesome books! I can't wait to read Sweet Venom!! I hope you enjoy all of your books!! Check out my IMM!! Love Under Cover just went on my wishlist ;) Gotta love IMMs. Thanks for stopping by mine! Hope you enjoy your goodies! Smoke and Bone is on my wishlist. Sweet Venom is on my wishlist. Happy reading! Daughter of Smoke and Mirror looks good. The Girl of Fire and Thorns read a review from from Mocha at Cupcake and a Latte sounded real good. Heard there was a cover change but still looks good. Thanks for sharing! Nice selection, Sarah. Isle of Night looks good, I'm adding it to my list! Thanks for stopping by my blog! I'm a new follower of your blog too! That is AWESOME that Amazon shipped early because Daughter of Smoke and Bone is AMAZING! I hope you LOVE it!! Great stuff this week! I loved Mostly Good Girls, a fun read! And I've heard nothing but great things about Daughter of Smoke & Bone, enjoy! A wonderful Mailbox! 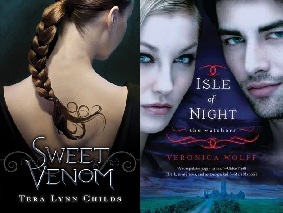 I cant wait to read Sweet Venom & Isle of Night.. LOVED Daughter of Smoke and Bone! :) Enjoy! Great books! 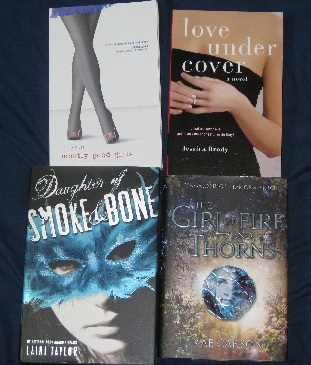 I got Daughter of Smoke and Bone this week too. I'm currently reading Girl of Fire and Thorns and so far its very good. Have a great reading week! My mailbox is here.